Conscience Canada | What can I do? 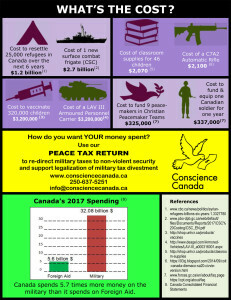 ✔ Conscientiously object to military taxation through the Peace Tax Trust Fund: Directing the military portion of your taxes (or a symbolic portion) into Conscience Canada’s Peace Tax Trust Fund sends a message to the Canadian government that you want your taxes to be used for peace, not war. The money is held in trust for you and will be returned to you upon your request (for any reason). ✔ Become a voting member of Conscience Canada: The size of our membership is an important indicator of the support for conscientious objection. Membership in Conscience Canada is open to any person who supports its objectives and is free of charge. As a member, you will receive two newsletters each year and be able to vote at the Annual General Meeting. Contact us at info@consciencecanada.ca if you would like to become a member of Conscience Canada. ✔ Join online discussions: Stay informed and involved. Our Facebook site offers ongoing information on fiscal conscientious objection and constructive alternatives to violence, and provides a network for political, legal, and moral support for conscientious objectors. ✔ Write to the Prime Minister, the Minister of Finance and your MP: Request the enacting of Conscientious Objection Tax legislation. This would allow COs to have all of their income taxes used only for peaceful and constructive purposes, and would help financially support alternatives to war. Identifying your MP: You can use this link or call 1-800-O-Canada (1-800-622-6232). ✔ Educate others about military taxation: We have pamphlets, booklets, and other materials you can use to promote awareness about military taxation and the possibility of contributing instead to peaceful alternatives. 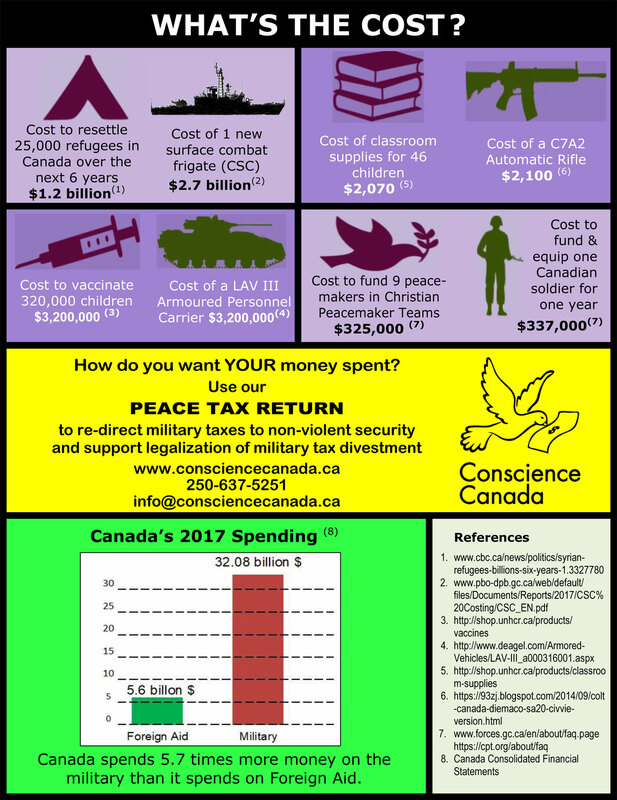 We encourage organizations to write letters supporting peace tax legislation. ✔ Volunteer with Conscience Canada: You can volunteer in a range of Conscience Canada projects (e.g., promoting CO legislation, networking, education). You can also support the organization more broadly by getting involved with fundraising events, or (for members) by serving on the Board. ✔ Make a donation: Conscience Canada is a non-profit, volunteer-based group. Donations go directly to educating for peace and creating a legal alternative to paying for war.